Devon’s River Taw is known to have a mind of its own – with a rapidly varying flow and a disregard for properties and assets in its way. The locally important ‘Tarka’ Railway line in North Devon follows the river along much of its length, connecting Exeter and Barnstaple – taking advantage of the wide floodplain through which it flows. 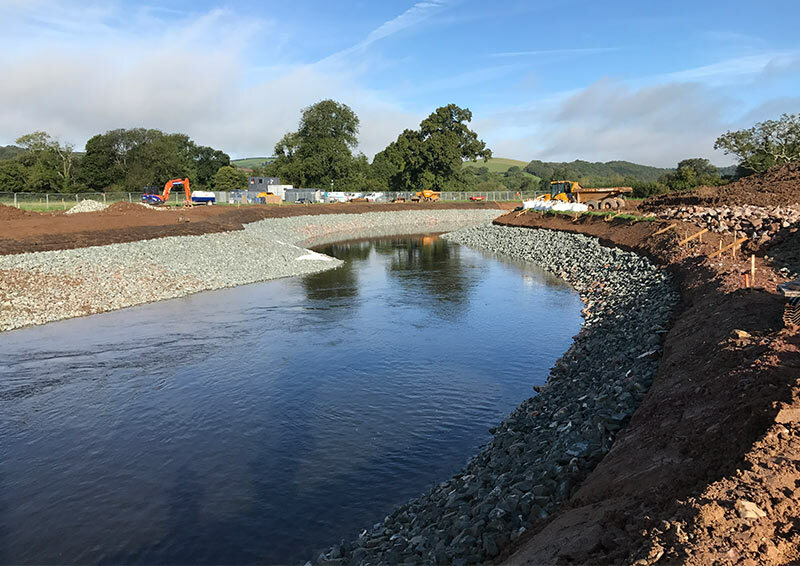 In June 2017, WSP was appointed by Network Rail to investigate the imminent collapse of a retaining wall at Colleton Mill, which was precariously supporting a length of the railway line adjacent to an aggressive meander of the River Taw. WSP was tasked with finding an innovative approach which would not only meet the site’s challenging ecological constraints, but also gain landowner and stakeholder approval. Conventional construction methods were not appropriate, yet a solution had to be found to prevent further migration of the river towards the railway. Ultimately, a radical approach to permanently move the river was conceived. This would see the Taw diverted back towards a historic meander, observed over 100 years ago. This would offer long-term operational security, resilience to climate change and allow the works to be implemented on time without environmental detriment. Most importantly, the main diversion works had to be complete within only a three month working window (from inception to diversion) in time for the salmon spawning season. Significant challenges were overcome, including the environmental permitting process and the requirement to construct the works before the winter floods. Against all odds and after weeks of frenetic activity - including the rescue of almost 4,000 fish - the team reached a major milestone on the 27 September 2017, when an entirely new channel was bought online, ahead of programme. Rachel is an Associate Director within WSP’s Water Specialisms team, which forms part of the Planning and Advisory Business. Rachel is a Chartered Environmentalist, Water and Environmental Manager. She leads the Exeter team and is responsible for the financial performance of the wider group at a national level. Rachel has a maths and physics background and has since developed flood risk and hydraulic modelling expertise. She is now heavily involved in Women in Engineering initiatives across the South West and beyond. Christopher is an Assistant Engineer in WSP’s Water Specialisms team, based in Bristol. He joined the team upon graduating in 2016 from Plymouth University, with contracting and consultancy experience. Chris has built upon his university and placement experiences whilst at WSP, through his involvement in projects such as Colleton Mill. He co-chaired the Flood and Coast Conference 2018 Next Generation Committee, has previously held a role on his local ICE Graduate & Student committee and actively promotes Early Career Professional initiatives within WSP and externally.